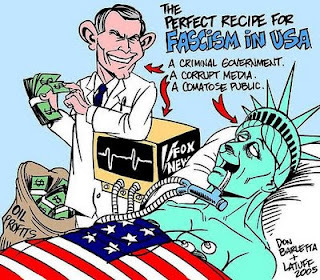 This post by Glenn Greenwald summarizing Bill Moyers' appearance on the Bill Maher show last night says it all regarding the current state of affairs in the USAofexpensivehealthcare. Think Progressive Party not tied to the dems or repugs . . . . Break in the Action . . . . Sorry for the gap in posting of late, but I've been visiting family in the USAofexpensivehealthcare the past week. 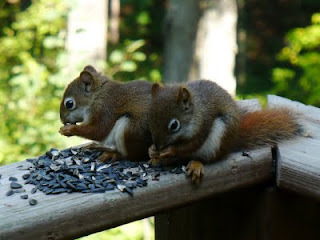 We had lots of family sharing my sister's house on a lake in the Upper Midwest. With the exception of the furry friends, they've all gone now. Kinda nice . . . . The "Three C's" . . . .
Once again, the group over at The Progressive Economics Forum has a great post. This one references the historical profiteering from US-inspired coups overseas. Why are we not overly surprised? It turns out that the stock of several companies rose sharply after secret meetings in which high government officials decided to give the green light to coup plans. For example, United Fruit Company’s stock rose when plans were made for the 1954 coup in Guatemala that ousted the regime that intended to nationalize its extensive banana –producing lands. Check out the whole post and it's related New Yorker post. Forty Years Later . . . .
For the good times . . . .
She's Not Happy . . . .
Methinks Hillary is not happy with the question . . . .
Gog and Magog. Good Grief george . . . . According to this month's edition of the Council for Secular Humanism's "Free Inquiry", g.w. bush felt "that Iraq must be invaded to thwart Gog and Magog, the Bible’s satanic agents of the Apocalypse." This is not a joke - no doubt to Bill Maher's chagrin - and James A. Haught details the story in his article "A French Revelation, or The Burning Bush." 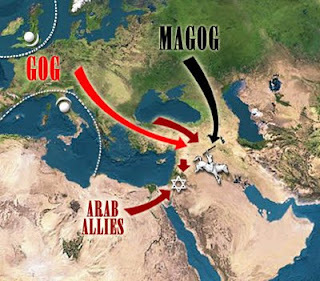 Incredibly, President George W. Bush told French President Jacques Chirac in early 2003 that Iraq must be invaded to thwart Gog and Magog, the Bible’s satanic agents of the Apocalypse. Honest. This isn’t a joke. The president of the United States, in a top-secret phone call to a major European ally, asked for French troops to join American soldiers in attacking Iraq as a mission from God. Oddly, mainstream media are ignoring this alarming revelation that Bush may have been half-cracked when he started his Iraq war. My own paper, The Charleston Gazette in West Virginia, is the only U.S. newspaper to report it so far. Canada’s Toronto Star recounted the story, calling it a “stranger-than-fiction disclosure … which suggests that apocalyptic fervor may have held sway within the walls of the White House.” Fortunately, online commentary sites are spreading the news, filling the press void. It’s awkward to say openly, but now-departed President Bush is a religious crackpot, an ex-drunk of small intellect who “got saved.” He never should have been entrusted with the power to start wars. Truth really is stranger than fiction at times . . . .
Maher Rules . . . .
Bill Maher has a New Rule posted at The Huffington Post today. Shake your head in astonishment. A few weeks ago I was asked by Wolf Blitzer if I thought Sarah Palin could get elected president, and I said I hope not, but I wouldn't put anything past this stupid country. It was amazing - in the minute or so between my calling America stupid and the end of the Cialis commercial, CNN was flooded with furious emails and the twits hit the fan. And you could tell that these people were really mad because they wrote entirely in CAPITAL LETTERS!!! At a recent town-hall meeting in South Carolina, a man stood up and told his Congressman to "keep your government hands off my Medicare," which is kind of like driving cross country to protest highways. Nearly half of Americans don't know that states have two senators and more than half can't name their congressman. And among Republican governors, only 30% got their wife's name right on the first try. Enjoy . . . . This is the first time in five years that I have not been able to see all the Celebration of Light fireworks competitions in Vancouver over English Bay just two blocks from our place. I did get to take in the opening night when Team Canada led off this year's competition followed by South Africa, the UK and the winning team of China. "drf" did get to see all four shows, and he concurs with the judge's decision. If you've never had the pleasure, do make an effort one year to take in all four shows. The shows are typically held the last two weeks of July on Wednesday and Saturday evenings. Although, it might make any subsequent fireworks shows rather pale in comparison . . . .
Salvation Shopping . . . . In addition to the local television commercials mentioned here, today's discovery is captured below. Have your credit cards handy, as I know you'll leap at the chance to get your holiday shopping done early. Since I've not been privy to local US TV in quite some time, this may not be a recently released marketing blitz. It is, however, the first time I've had the pleasure (?) of enjoying it. "Taxi*!! Airport, please . . . . "
* That's actually an attempt at humour. There are no taxis within 25 miles of here. The Only Thing Between You and Your Doctor Is . . . .
A high-paid lobbyist, no doubt. One of the few real journalists left has been running a series of programs on US health care "reform" the past few weeks. I'm just catching up on my podcasts after travelling last week, and this Bill Moyers piece with Trudy Lieberman and Dr. Marcia Angell is great. "drf" and I have long doubted any substantial "reform" of the industry, and after listening to this, I'm even more convinced that it won't happen. Actually, Dr. Angell makes a strong case for the plans being considered to be scrubbed and replaced with single-payer as "the only thing that can be done" to accomplish real reform. She's right . . . .